E Tū Whānau is a movement for positive change. The E Tū Whānau Rangatahi Film Challenge is a collaboration between Māoriland and E Tū Whānau where rangatahi film leaders travel across Aotearoa to teach other rangatahi how to make films. Each workshop is just two days long. In this time, the workshop participants have to brainstorm, shoot and edit their short film for presentation. It’s rapid fire film storytelling that challenges rangatahi to speak from the heart. In 2018, Māoriland Charitable Trust held workshops in Kaitaia, Whangarei, Tāmaki Makaurau, Whanganui, Porirua and Ōtaki. 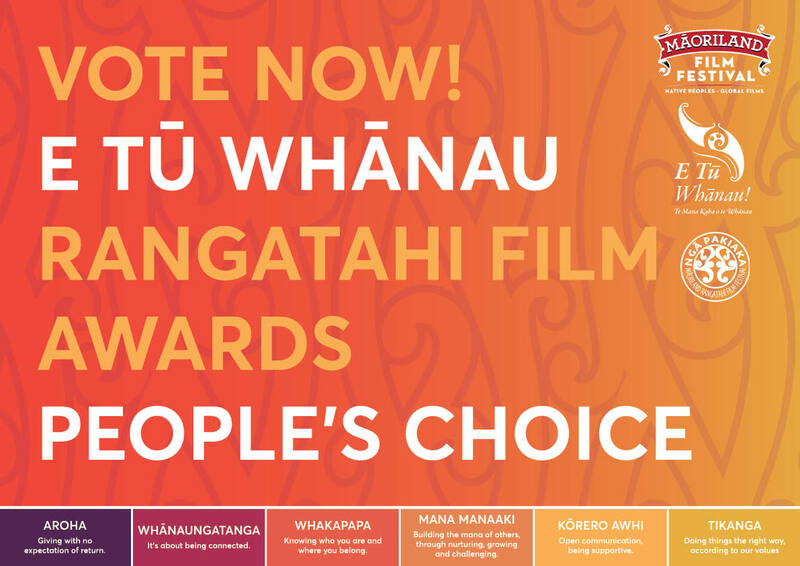 Submissions also were entered from all over the country with 14 short films selected for the annual E Tū Whānau Rangatahi Film Awards. This year, we are introducing a people’s choice award for 2019. It’s your opportunity to support the work of our rangatahi – and the winner will get $500 towards their next project! Of these 14 films, only 6 could be selected for awards. Wāhine Toa spotlights Chrissy Hilton of Te Whare Tu Taua o Aotearoa, aka the national school of Māori weaponry. She shares her experiences and challenges of being apart of this kaupapa from the perceptive of a young Māori women. Bubs was made during an E Tū Whānau Rangatahi Filmmaking workshop in Porirua. It’s a story about whānau and how we can look after eachother. A short film portraying what many young Māori in South Auckland experience in their homes. He wants to encourage those who have grown up in similar environments to fight the pain of mental illness, poverty and violence, to carry on and strive for a better lifestyle. Life of GI is a story about a young man who comes from the South Island to find out about his Māori heritage. He is reconnected with his estranged brother and meets many new people along the way to help him on his journey. He struggles but can also see that he is improving and is gradually becoming more interested in the Māori culture. This award goes to Te Waiarangi Ratana for his beautiful performance as Bub’s older brother Rangi. Te Waiarangi is also a filmmaker himself and a film student based in Wellington. Our last award goes to a spectacular young filmmaker who has shown exceptional talent and a depth of storytelling that grabbed the hearts of our judging panel. Luka Wolfgram submitted two films – Dear Grief and What Matters Is. We cannot wait to see what he creates next.